In association football, an assistant referee (known as a linesman or lineswoman before 1996, expressions which are still in common unofficial use) is an official empowered with assisting the referee in enforcing the Laws of the Game during a match. At most organised levels of football the match officiating crew consists of the referee and two assistant referees, with one assistant referee assigned to each touchline. The assistant referee's duties generally consist of judging when the ball has left the field of play – including which team is entitled to return the ball to play, judging when an offside offence has occurred, and advising the referee when an infringement of the Laws of the Game has occurred out of his or her view. Depending on the local match rules and the discretion of the referee, an assistant referee may also be responsible for various administrative tasks, for example managing substitutions, helping the referee control the players, or replacing the referee if he or she is unable to continue. The assistant referee functions in an advisory role, and all judgements made by an assistant referee may be overruled by the referee. At higher levels of play the referee is also assisted by a fourth official. The fourth official's duties are usually administrative in nature and vary depending on the match rules and the discretion of the referee. Common duties for a fourth official may include managing technical areas and substitutions, maintaining a backup record of the score, and cautions and sendings off, and displaying information on substitutions and extra time to spectators. Depending on the local match rules, the fourth official may replace the referee or one of the assistant referees if they are unable to continue. All decisions by the assistant referees are only advisory to the referee, i.e. their decisions are not binding and the referee is allowed to overrule an assistant. An assistant referee may also be called upon by the referee to provide an opinion regarding matters which the referee requires clarification on. Occasionally the assistant referee will assist in player management during free kicks, as well as provide visual assistance during penalty kicks. The assistant referees also usually assist the referee with preparatory and administrative functions. 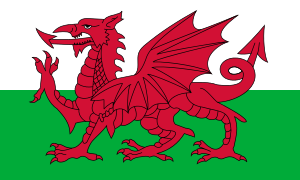 Assistant referees wear a uniform identical to that of the referee and carry brightly-coloured flags (usually red, yellow, or some pattern involving those colours) which are used to indicate their decisions to the referee, players, and spectators. During the game each assistant referee oversees one touch-line and one end of the field utilising the diagonal system of control. The more senior of the two assistants will normally occupy the side of the field containing the technical areas, to help oversee substitutions. At higher levels of play, the assistant referees' flags may be equipped with buttons that the assistant referee may press to send an audible signal to the referee in order to get the referee's attention. Also at the highest levels of play, particularly in matches held in large stadiums, the entire officiating crew may be equipped with wireless microphones and earpieces to facilitate vocal communication across long distances or through loud stadium noise. Assistant referees were formerly called linesmen. In 1996, the name was changed, primarily to better reflect the modern role of these officials, and secondarily to become non-gender specific. They are also sometimes incorrectly referred to as "referee's assistants". 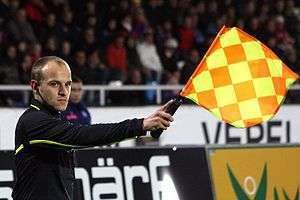 However the term "linesman" is still commonly used, including at lower levels of play where, if the match governing body does not appoint assistant referees to a match, a referee may be empowered to appoint volunteer "club linesmen" who may usually only assist the referee in judging whether the ball has left the field of play. The fourth official assists the referee in a variety of tasks, and may be called upon to replace another match official. The fourth official is a recent addition to the officiating crew. English referee and administrator Ken Aston introduced the practice of having a named replacement referee in 1966, but the International Football Association Board (IFAB) did not officially create the position until 1991, and listed only areas of responsibility. The fourth official is simply instructed to assist the referee at all times, and his duties are largely at the discretion of the referee. His usual duties can be broadly divided into assisting functions and a replacement function (see below). The fourth official typically has a table a short distance from the touchline between the two teams' technical areas, however his positioning is not defined by the Laws of the Game. In practice, the fourth official becomes a key member of the officiating team, who can watch the field and players and advise the referee on situations that are going on out of his sight. The fourth official keeps an extra set of records, and helps make sure the referee does not make a serious error such as cautioning the wrong player, or giving two cautions to the same player and forgetting to send off the player. The fourth official played a significant role in the 2006 World Cup final when fourth official Luis Medina Cantalejo informed referee Horacio Elizondo of the headbutt of France's Zinédine Zidane against Marco Materazzi, resulting in Elizondo showing Zidane a red card and sending him from the field. French manager Raymond Domenech accused Cantalejo of using the replay board to initiate the process that led to Zidane's ejection, which would have broken FIFA rules, but FIFA maintained that Cantalejo did not breach any rules and acted properly. The fourth official serves as a replacement official in the event that one of the other officials (referee or assistant referees) cannot continue officiating, usually through injury. In situations where an assistant referee is unable to continue, the fourth official replaces that assistant referee. In situations where the referee is unable to continue, the fourth official replaces the referee directly, or the senior assistant referee replaces the referee, with the fourth official in turn taking an assistant's position. Competition rules are supposed to clarify which of these options is to occur. If for some reason it is not stated, then typically the official with the most refereeing experience (either the fourth official or the senior assistant referee) will replace the referee. Assistants beyond those discussed above are generally uncommon. However, extra official roles have been trialled in a few international tournaments. For matches in the 2006 World Cup, FIFA assigned five officials. The role of the fifth official is to assist the fourth official in a variety of tasks, and potentially be called upon to replace another match official if necessary, for example in the case of injury. If an assistant referee could not carry on his duties, the fifth official was to be the primary replacement, whereas the fourth official was the referee's primary replacement. This distinction was made to reflect the fact that assistant referees and referees perform different tasks. The fifth official had access to television coverage of the match, but was not permitted to advise the on-field referees of any incidents they had missed. Speaking after the 2006 FIFA World Cup Final, Italy coach Marcello Lippi claimed that the referee had sent off France player Zinedine Zidane after receiving advice from "the fourth and fifth officials looking at the video at the edge of the pitch". These claims were subsequently denied by FIFA. 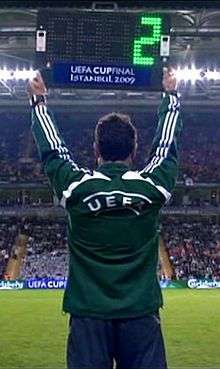 Recent trials, for example at the 2009–10 UEFA Europa League group stage, have been started to make place for an additional two assistant referees to be added to the game, positioned behind the goal lines, to "ensure that the Laws of the Game are upheld, informing the referee of incidents of any kind that he may otherwise have missed, particularly in key areas of the field like the penalty area and its surroundings," but only informing the referee of their observations through a wireless communication system. Their positioning gives a good view to assist the referee in "ghost goal"-type incidents. The trial was evaluated by IFAB technical experts. This trial was later extended to the 2011–12 UEFA Champions League and qualifying games and the final tournament for the UEFA Euro 2012. Their reception has been mixed. Following a two-year experiment in the UEFA Champions League, Europa League and Euro 2012, as well as the AFC President's Cup and competitions in Brazil, France, Italy, Morocco and Qatar, the use of additional assistant referees was approved by the International Football Association Board (IFAB) in July 2012. Additional assistant referees were used in the 2013 Scottish Cup Final, the first time they had been utilised in a domestic match in Scottish football. Wikimedia Commons has media related to Assistant referees. Wikimedia Commons has media related to Fourth official. 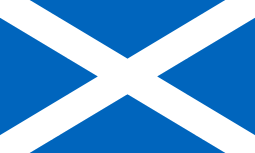 ↑ Refereeing & Disciplinary – The Fourth Official: the Scottish Football Association website. Retrieved on 28 February 2008. ↑ Definition of the fifth official: PDF file (page 8) quoting the "IFAB Agenda 2007". Retrieved on 14 May 2012. 1 2 Poll, Graham (9 April 2009). "The Official Line: How many referees do you need for an FA Cup semi-final?". Daily Mail. Associated Newspapers. Retrieved 17 August 2013. 1 2 "Fifa denies video evidence claims". BBC Sport. BBC. 10 July 2006. Retrieved 17 August 2013. ↑ Ingle, Sean (10 July 2006). "Sending-off is put down to video use". The Guardian. Guardian News and Media. Retrieved 17 August 2013. ↑ "Two extra pairs of eyes for referee teams". UEFA. 28 August 2009. Retrieved 29 August 2009. ↑ "UEFA Announce Two Extra Assistant Referees in Next Season's Champions League". Goal.com. ↑ "IFAB makes three unanimous historic decisions". FIFA.com. 5 July 2012. ↑ "Willie Collum and additional assistants appointed for final". BBC Sport. BBC. 7 May 2013. Retrieved 17 August 2013.